When you were a kid and were asked what you wanted to be when you grew up, how many of you leapt to the idea of becoming a doctor? Healing the sick and working some fifty hours in a row until you were dead on your feet and then had to risk being accused of malpractice? Having to be asked over and over which of the nurses were your love interest and which of the doctors was the most conniving, savage, funny, or the giantest doctor in the world? As much as we might wish it to be otherwise, our television dreams of being a doctor aren’t quite matching the reality of the world we live in, that’s for sure! Sometimes we just have to wonder if there isn’t a shortcut… a way to vicariously live out the life of the doctors but closer to the way that we imagine they live rather than the rough work that they more often have to confront. Well, it is a good thing that they make a season every year that helps us do exactly that! It’s time to skip that whole Medical degree requirement and hop right into your professional Scrubs costume. The polyester/rayon poplin blend pullover shirt has short sleeves and a rounded neckline and the matching pants have a simple elastic waistband. 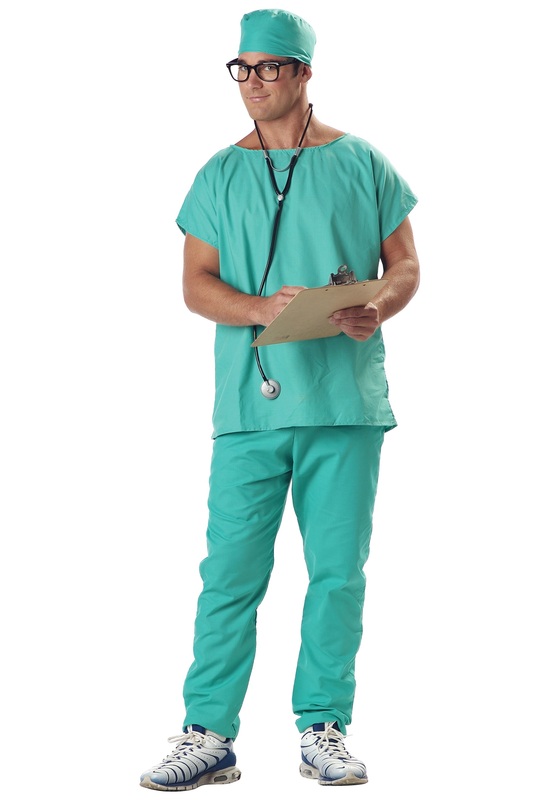 Make sure to don the cap to meet hospital regulations and don’t dare forget to bring your stethoscope along with you! TV has taught us that you can get in big trouble if you forget that! And, in case the world of hospital medicine isn’t for you, just pick up some alternative accessories and the scrubs translate just fine into dentistry! Purchased this for my 11 year old son. He's 5'1" & is 113lbs. I ordered a medium, and I'm glad I did. The waistband is elastic and fits him perfectly. Material is 100% polyester and the tag says to spot clean only. I will just have to hem the bottom of the pants a bit so they don't drag on the ground. Both my son and I are very happy with this costume.